Lovely Ladies – Another So Sketchy Card! Here is the second of three cards I did for the So Sketchy Blog. Allison’s sketches are so interesting! If you like sketch challenges, you have to to visit often. She comes up with really interesting card and scrap page sketches. Link on the sidebar! I like asymmetrical sketches best and this one is relatively symmetrical. So on all of my cards, I did something other than use the two vertical rectangle panels in the sketch. On the beach card a couple of posts ago, I used fish net. Here I used the two ladies in place of my vertical panels. They are coloured with Copics and adhered with foam dots. Only problem was, I distressed the panel below with the new Versamark Twinkle ink called Champagne. If you haven’t tried it, it gives you a very subtle shimmer similar to a Spica pen or very fine glitter gel pen. I haven’t used it for stamping yet but so far, I really like it. So why was this a problem? Like all pigment ink, it stayed wet for a very long time and the foam dots wouldn’t stick! GRRRR!! I really liked the result though. The striped May Arts ribbon I bought from Sharon Johnson of No Time to Stamp? Click on the link at the top of the page right under her blog banner to see other May Arts ribbon she has for sale. The rosette in the center is made by my great friend Rebecca-thank you! It is hard to see of course but the card base is sprayed with Glimmer Mist. TIP: I read somewhere that if you spray your paper while it is held vertically, you are less likely to get blobs that drip off the nozzle than if you spray while the paper is on a flat surface. Stamps: ladies-Rubber Baby Buggy Bumpers (I think), french script bkgd by SU! Paper: Graphic 45 patterned paper, Bazzil textured CS, vanilla, black CS-SU! Previous postEasy Way To Sew On Buttons-Sneak Peak! STUNNING!!! I love vintage and this is just beautiful!! Love how you’ve incorporated the “ladies” into this layout and the ribbon/paper are fantastic!! I’m so glad Sharon guided me to your blog!! i saw this on her blog and loved it then! It’s one of the best cards I’ve ever seen! Seriously! 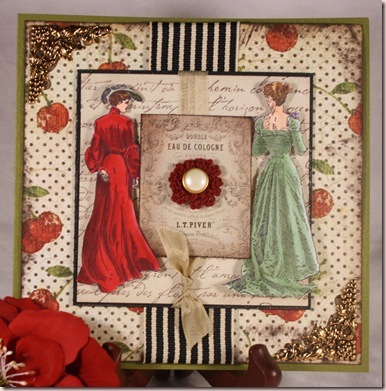 I love the victorian ladies and then pairing them with the more modern cherries and striped ribbon – it’s just fun, and graphic and perfect!! Oh my goodness gracious!!! What a STUNNING card!!! There is just so much to look at!!! Your ladies are beautifully done and I love the combo of patterns, papers, ribbons, embellishments!! Truly a work of art – I LOVE IT!!! And thanks much for the link!!! You’ve done a FAB job with the ribbon here!!! VERY inspirational!! !